Head to the largest island in the Auckland region, great forests, beaches and bays providing scope for all kinds of wilderness adventures. The flights aren’t too expensive and can be considered an experience in itself. The ultimate island retreat with its many vineyards and wineries, only a 35-minute ferry ride from Auckland. Rent a bike and discover everything Waiheke has to offer! The turquoise waters of the bay and its 150 undeveloped islands is bound to provide you with that holiday feeling. There are tones of things to do, including incredible boat tours and water sports. 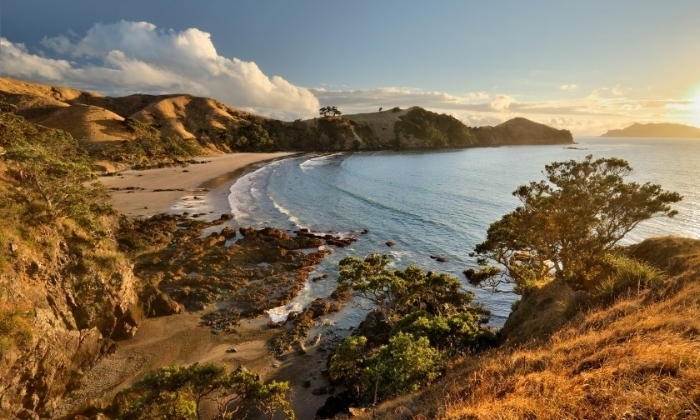 With some of the North Island’s best white-sand beaches and amazing walking tracks, there is somthing for everyone. Only 2 hours drive from Auckland, you will find yourself enjoying the splendid isolation in no time. New Zealand’s most famous surfing town is known for its relaxed atmosphere. Cool down in the waves after spending time on the beautiful black sand beaches. If you don’t feel like surfing, you can hike Mount Karioi (an ancient volcano), which has amazing views on a clear day (you might even see Mt Taranaki! ).